Find and implement new investment ideas first. If you’re on the sell-side, you're under constant pressure to find novel investment ideas and publish volumes of research notes and reports. 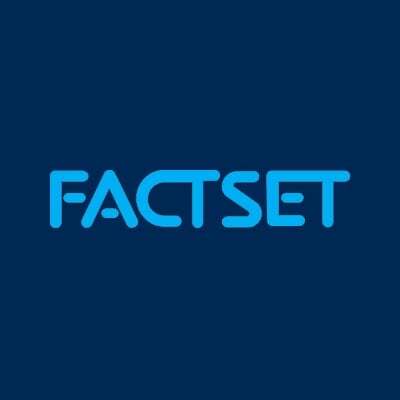 FactSet can help you develop correct non-consensus views and conduct proprietary research with a complete research solution, that allows you to perform deep company and industry analysis, manage relationships, and disseminate your research. If you’re on the buy-side, you also need to identify new investment opportunities, do your homework, and share your findings with colleagues quickly and efficiently. FactSet can help you complete the routine parts of financial analysis quickly and easily, leaving you with more time to think about your next idea or work on the proprietary research you need to fully test your hypotheses. Stay ahead of trends and events. Get the latest financial information and spot trends in markets all over the world with real-time market news, summaries, and updates from many news sources covering global markets. 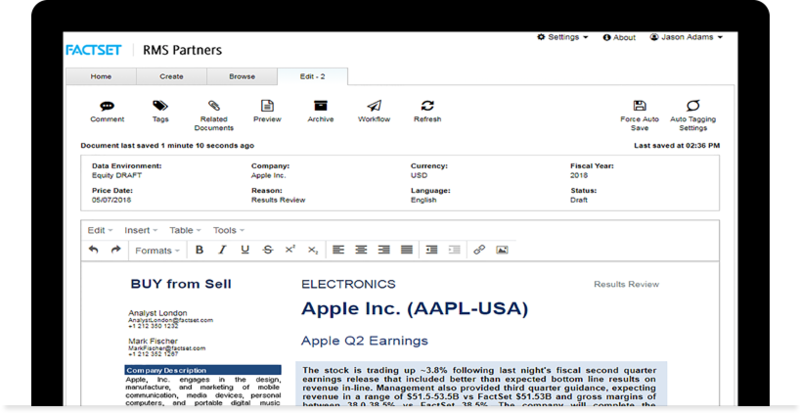 With Microsoft Outlook integration, you can synchronize financial earnings and event calendars with your Outlook calendar, so you never miss an earnings report or any company event. 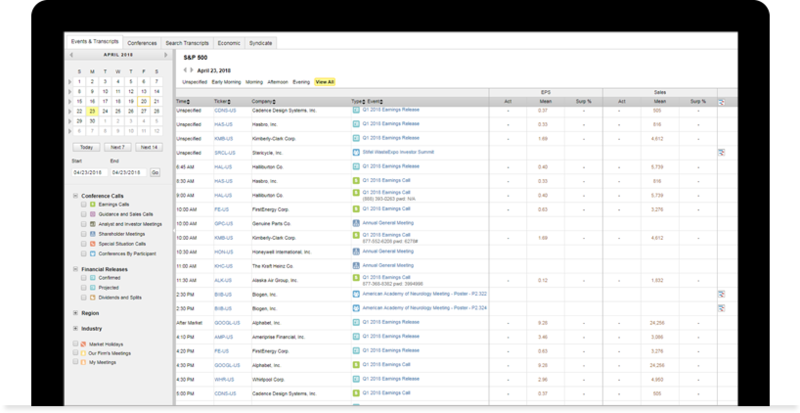 Use FactSet to identify and research the stocks, bonds, and other instruments with the characteristics that meet your criteria. 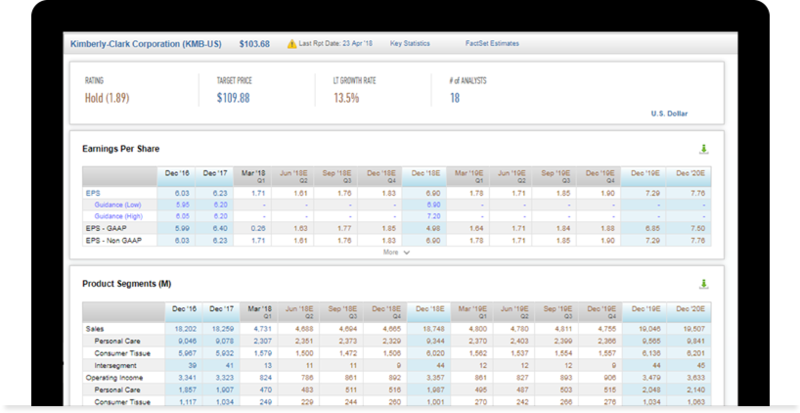 Easily build highly customized templates to track shifts in your sector’s fundamentals and identify relative valuation anomalies as they emerge. Dig deep into company financials and industry fundamentals to uncover mispriced securities that lead to investment opportunities. Find comparable companies and determine potential revenue generated by region, industry, or sub-industry, with unique data sets like supply chain data. Assess public and private company financial strength with capital structure and debt financing data to identify which companies need to raise capital and which have extra cash on hand. See a macroeconomic view of industries and sub-industries, including key players, sales and earnings outlooks, consensus estimates for Revenue, EPS and other items, price/earnings and other valuation metrics, historical revenue and earnings, commodity prices affecting the industry, and historical pricing and returns. Compare your forecasts with the consensus to figure out which of your high-conviction forecasts are truly non-consensus. Quickly integrate new information by exporting content from HTML or PDF documents directly into your Excel models. For a different view, visualize your ideas with FactSet’s charting tools and extensive data to find trends and spot discrepancies. Compose, publish, and distribute your ideas and research. Sell-side researchers can easily transition from research to publication and distribution with FactSet’s research publication and distribution tools. Gain greater control over data management, authoring, compliance, and distribution processes. 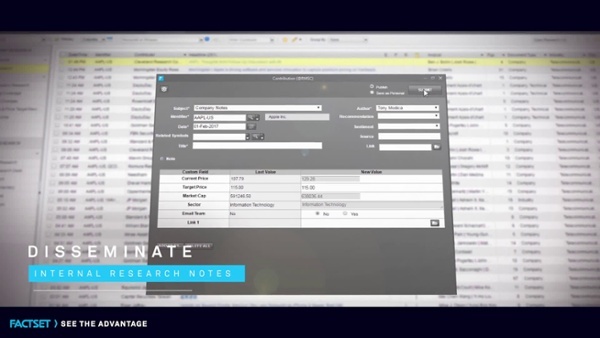 Locate the institutional owners of the stock you are covering and quickly disseminate your research reports and notes to them and the greater financial community. 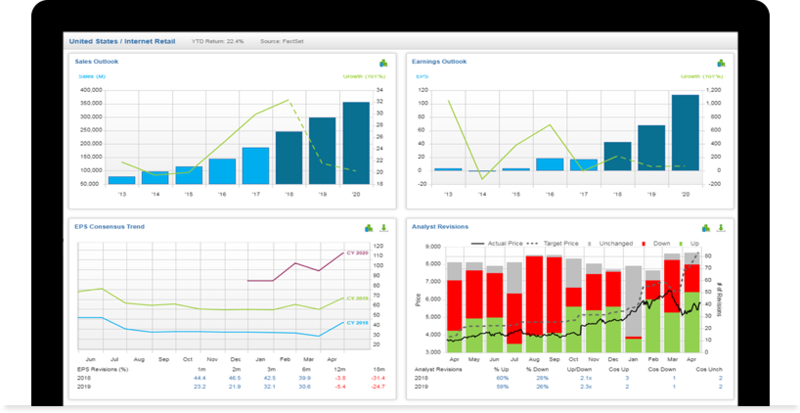 On the buy-side, FactSet’s RMS suite enables you to track the evolution of your thinking and share it with colleagues. Use RMS to quickly compose notes at your desk or on the road with our mobile products and share them with colleagues instantly. FactSet's integrated suite of solutions can also help you comply with the research unbundling requirements of MiFID II. On the sell side, you can permission only those clients that need to see your research and leverage readership data to measure and track research readership On the buy side, you can easily track and rate the sell-side research you consume, which simplifies your work at broker vote time.